The dry food - cereal dispenser provides a fun, easy to use storage and dispensing. Kids love it and think it is cool, and adults appreciate its portion control benefits. The double canister dispenser allows for variety and at the same time keeps your food fresh. 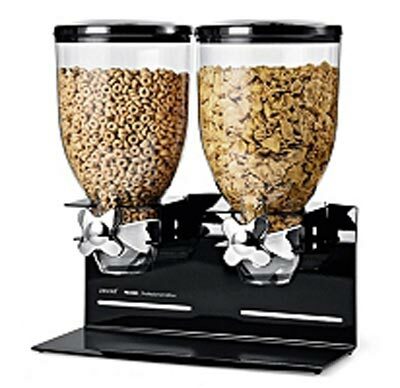 The cereal dispenser is constructed of a durable and easy to clean powder coated steel base, the dispenser's canisters are scratch resistant and shatterproof.